Ala Archa – Traveling Epic! Oh Kyrgyzstan, how I love thee. What an incredible culture. I really really enjoyed the people and mountains of this vast rugged territory. The loyalty and incredible friendliness of the people still strikes me. 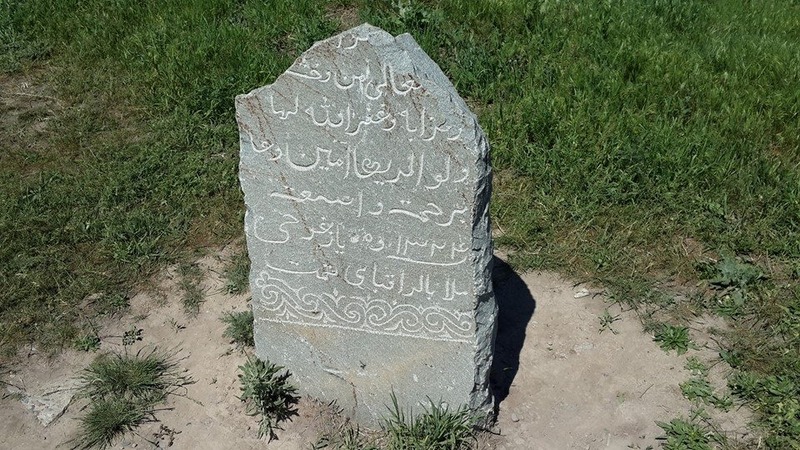 I really enjoyed visiting these amazing places that were important sites of the silk road and played an important part of the world’s history that has since been lost in much of the history books and easily overlooked. These former soviet republics have a history of their own and are very worth visiting as they each have their own cultures and traditions. 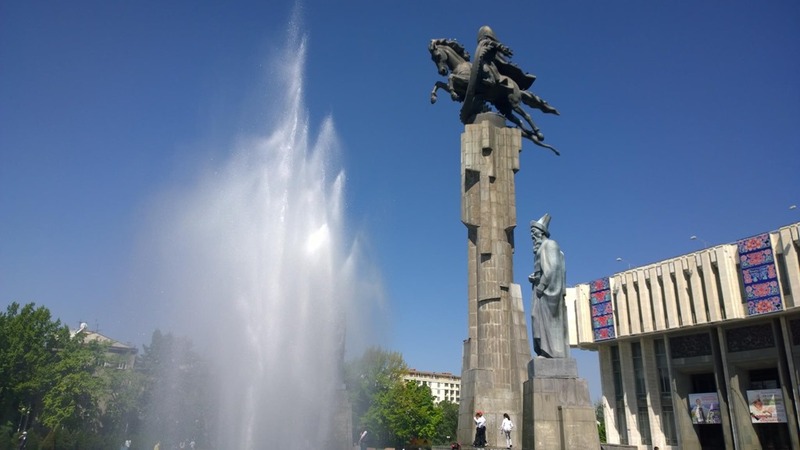 I didn’t really know what to expect when I discovered I’d have 4 days in Bishkek before we’d continue on to Almaty. 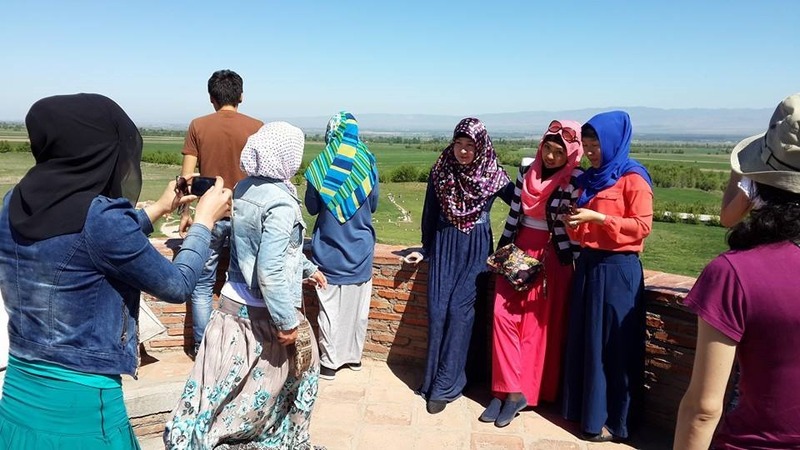 At first I was a little worried by what I’d seen on simple image searches of Bishkek. As a city you can see it in a day or based on my drivers thoughts… an hour, but get outside the city and day trips and you’re in one of those lifetimes that you need to have to find the depth. I need to share some stories to help you really understand why Kyrgyzstan really captured my heart and became one of my favorites. I want to help you understand how I saw this place which really reveals my formula. If you look at the pictures of what I saw vs. a quick image search of Bishkek or even a virtualtourist.com search of Bishkek and you see a big difference. On this trip, I took a traveler’s perspective. I did very little research before going. I made a reservation because I had heard from a friend who was there a few months prior that I might have a challenge in the airport. I personally have never allowed language to stop me from visiting a place, but I did once have to visit more than half a dozen taxis on an island in China to find one driver who could take me where I wanted to go. In this case, I like to build a home base. I like to make a connection with a local and a hotel to start my travel from. On facebook I started with a search, “My friends who live in Kyrgyzstan” – 0 results. 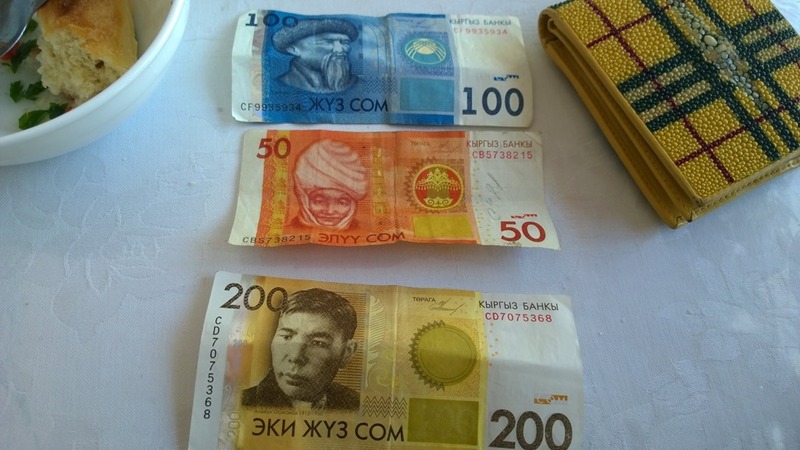 “My friends of friends who have friends who live in Bishkek, Kyrgyzstan” – a handful of results. I reach out to Monica, and ask her if she could introduce me to her friend Azat. 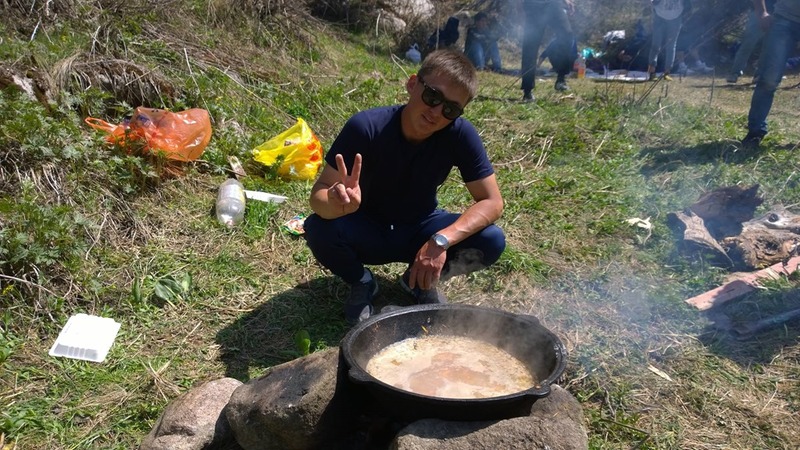 After being introduced, I discovered that not only did Azat live in Bishkek, but he spoke pretty good English and had even visited the United States. Monica had visited him while in Bishkek and with that introduction, I had a true friend. 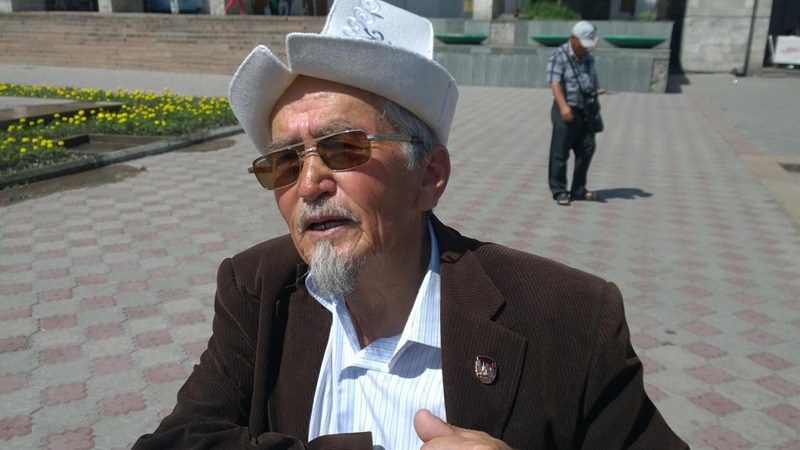 In the world of Kyrgyzstan that friendship I would find would be so profound. The people have a rich heritage and rich loyalty. 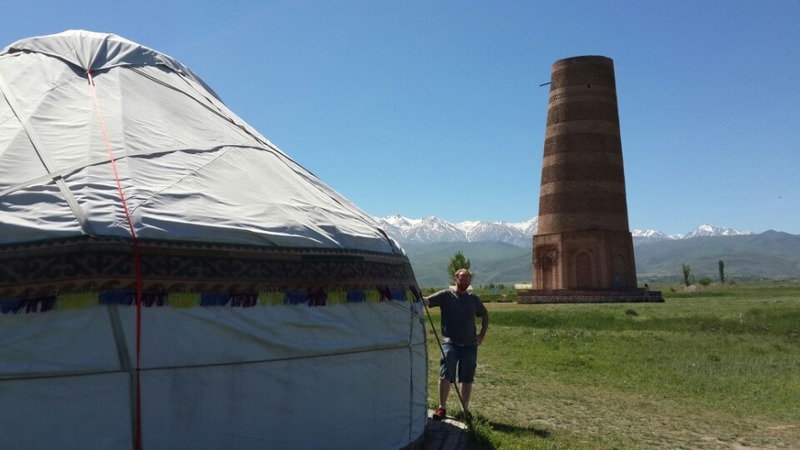 I was traveling to speak at a conference in Barcelona and planning a trip across Central Asia, but my friend Michael had already visited Bishkek, Kyrgyzstan. He’s the one who had mentioned language may be a challenge. With Barcelona as my starting point I found a flight on Pegasus airlines a very discounted airlines that has some really fascinating destinations. 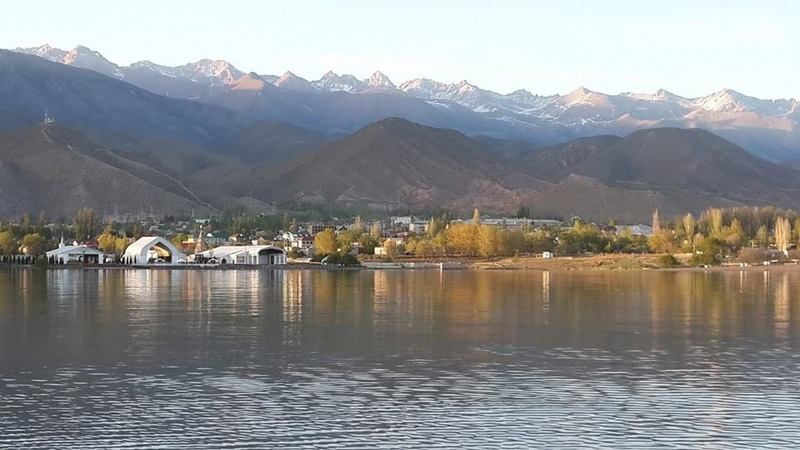 For approximately $250 I could fly from Barcelona and connect in Istanbul to Bishkek on a flight that would take about 10 hours or so to arrive. For the price, I was crazy not to take it. In all my travels across Central Asia, this flight would save me about $1000 vs other routes. I did some searching and made a reservation with Booking.com at RIch Hotel. Four stars and an 8.4 user rating for $70. I was pretty excited. I was pretty happy with Rich Hotel. The facility met my needs. Good bed, clean sheets, ok (free) hot personally made breakfast (eggs and toast) and juice, but it was the driver that I really connected with. He didn’t speak a lot of English, but over the course of the few days, we both got really comfortable with each other. My driver would me on private tours of the city, take us to some fantastic places. Here’s the quick list of where we went and amazing must see places. I’ve been surprised how some of these fantastic places haven’t really been discovered. This square is the central square for the city and in the past has been a place of gathering for political protest it still is a great place to see the people gathering and children playing around the fountains. Across central asia, fountains are found in the centers of cities and the people go there to relax and socialize with their friends. Ала-тоо аянты Площадь Ала-Тоо is the central square in Bishkek,Kyrgyzstan. 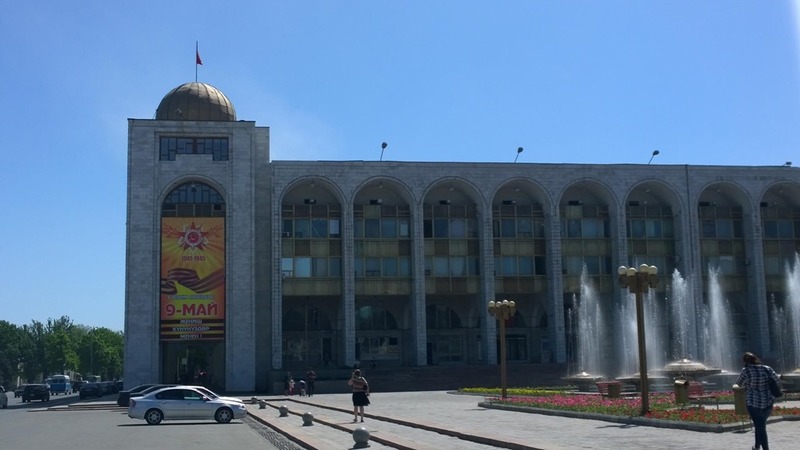 The square was built in 1984 to celebrate the 60th anniversary of the Kyrgyz SSR. At one point it had a statue of Lenin that was later moved to a smaller square. Erkindik(Freedom) was installed in its place it has a statue of Chinghiz Aitmatov. You can read about it’s significance in the Tulip revolution for gathering and protest in 2005. 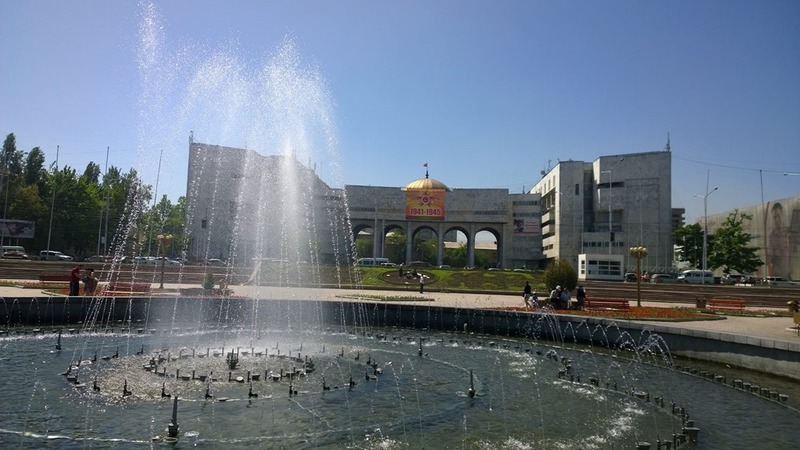 Interesting Soviet style buildings from 1984 surround the fountains. It was at the square that I saw this wise man, I wanted to talk with him and ask him if I could take his picture. 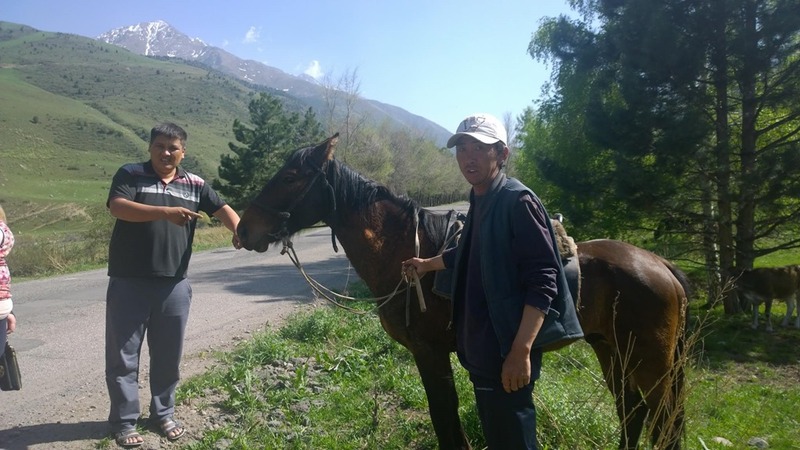 He didn’t speak any english, but my driver from the hotel helped us find out that he was from deep on the other side of Kyrgyzstan and he was visiting. He was anxious to talk with me and share. As my first real interaction with a local that wasn’t associated with airport or hotel, I was very impressed with how nice he was and how he was happy to let me take his photo and share his wisdom. 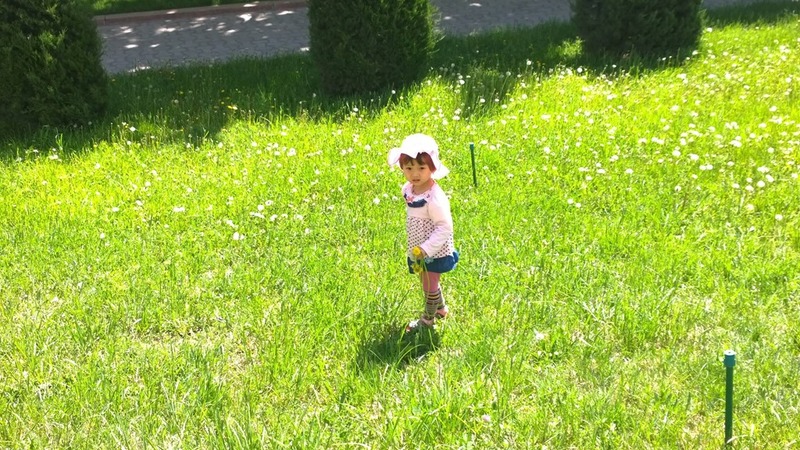 This little Kyrgyz girl was gathering dandelions and flowers. I couldn’t resist taking a photo to capture the memory. So innocent. 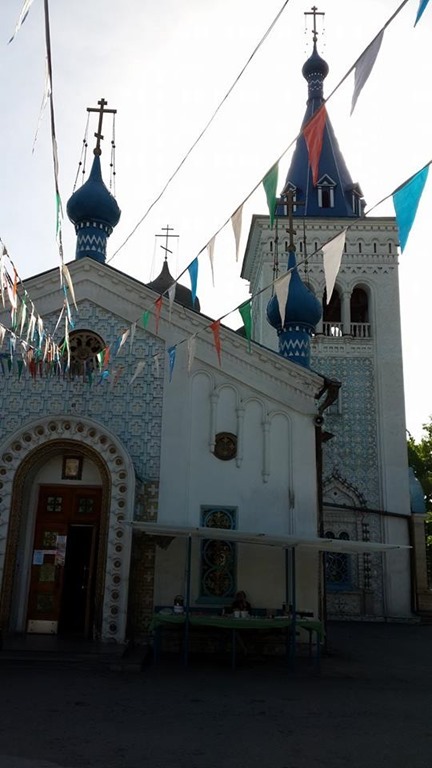 Old Russian Orthodox church in Bishkek was a quick pass by. I asked the driver to stop so I could take a picture. Going inside was even more fascinating. 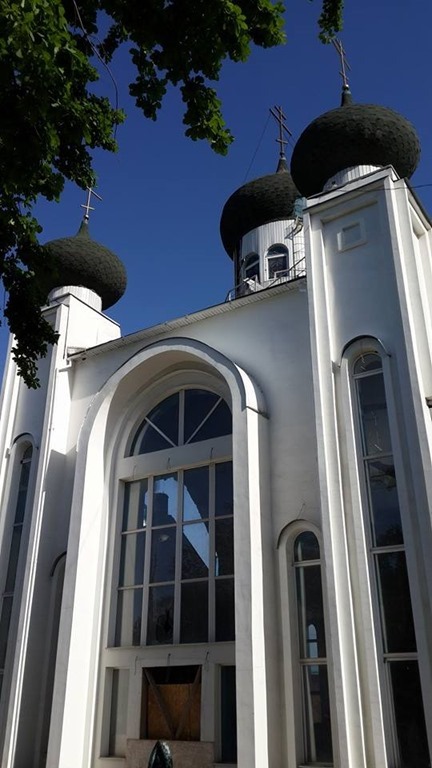 During the Soviet times, religion was repressed, and few of these buildings remain. 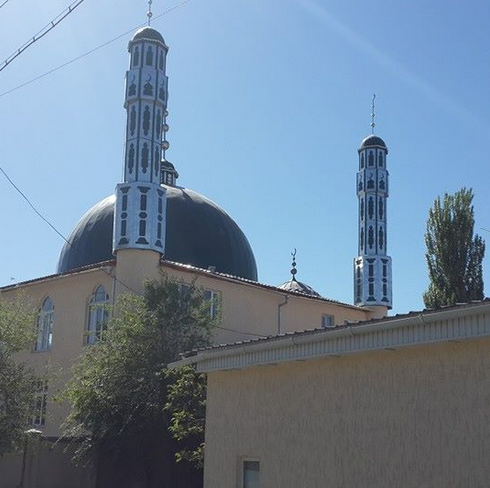 The church on the right above is bombed out, but the domes remain. 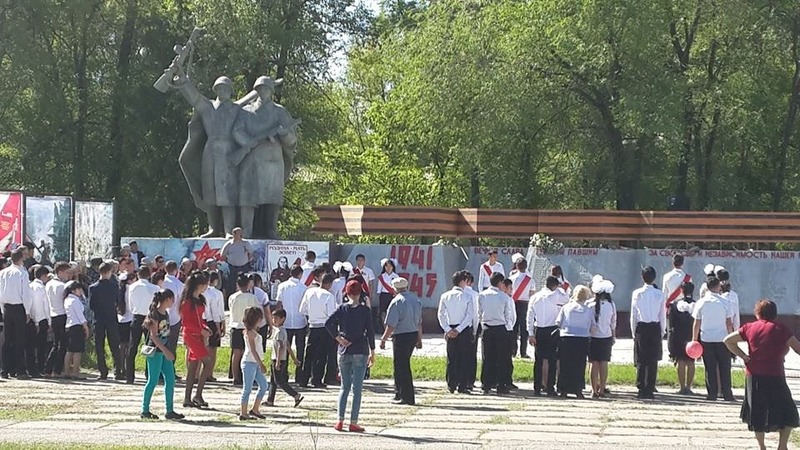 It so happened while I was in Kyrgyzstan there were celebrations to honor the world war II veterans and remember… Never forget. With as much opposition as there has been it’s very interesting to think that the US and Russia were allies during both world wars. Less than an hour outside the city and for about $30, I full day trip to explore the mountains. Think Switzerland, but even more remote and unseen and unknown by western ways. Ala Archa is a national park that has a small fee, but has trails to falls and along glacial rivers with incredible views of the valleys. Swiss Chalet? Looks like it, but here you can get fresh water or some soup or local horse or sheep milk yoghurt drink. 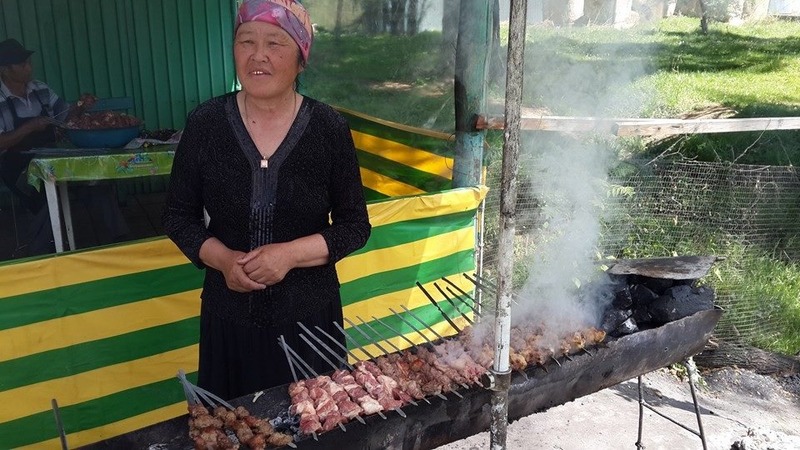 This is life in rural Kyrgyzstan. Simple, traditional, and living life the way the ancestors did. Huge respect for this type of natural living. Is there more green ways than the idea that no one should own the land and that we are simply transient and all of us will move on in our journey in life? It wasn’t unusual to find shepherds tending their flocks of sheep, goats, and cattle. What was unique about this was my driver offering to talk to the shepherd to allow me to ride his horse. Sure enough he obliged and I had a great ride around the little hills. I referred to my facebook friend Azat. He arranged to meet me after my excursion in the hills. He was getting off work and invited me to have a traditional meal with his family. 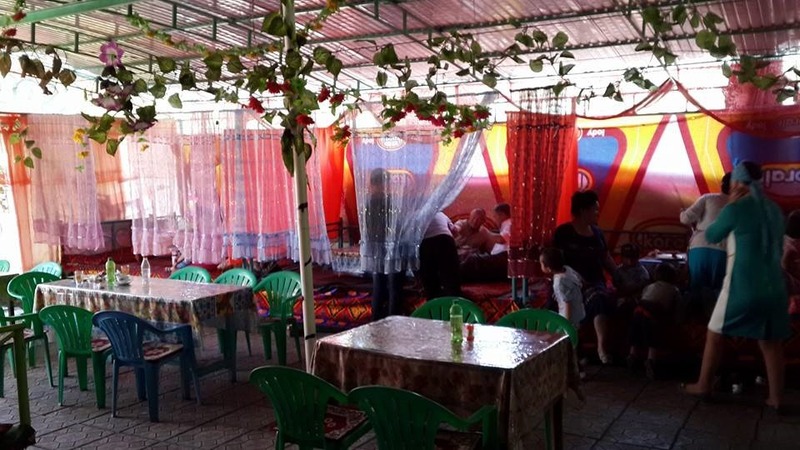 I was very very excited to have such an authentic experience to really meet locals that I could talk to and better get to know what life was like in Kyrgyz. He was a technology guy like myself, so we already had that in common. 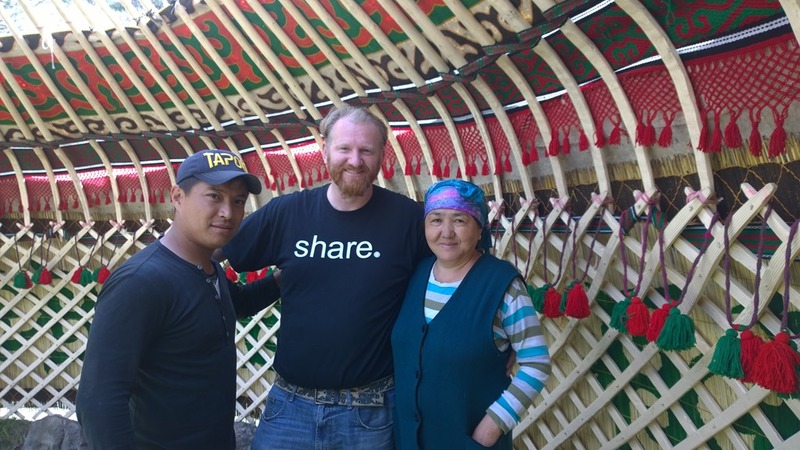 He picked us up at our hotel and brought us to his apartment in the city of Bishkek. 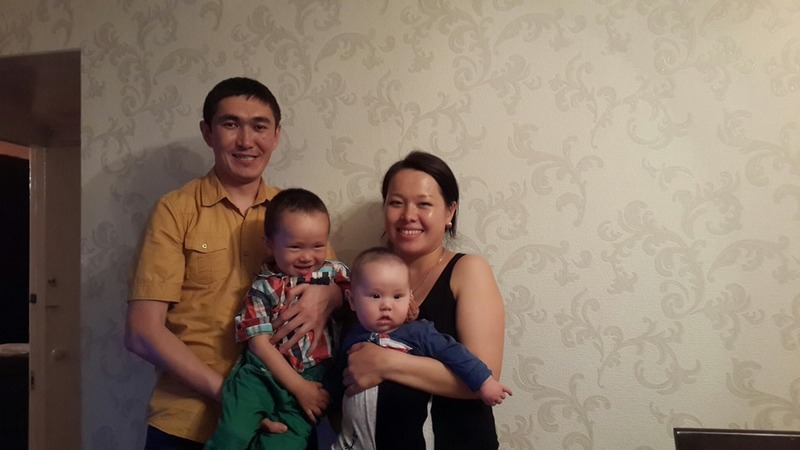 Azat has two little boys and an amazing wife who spent probably all day working on our meal. The food was amazing. 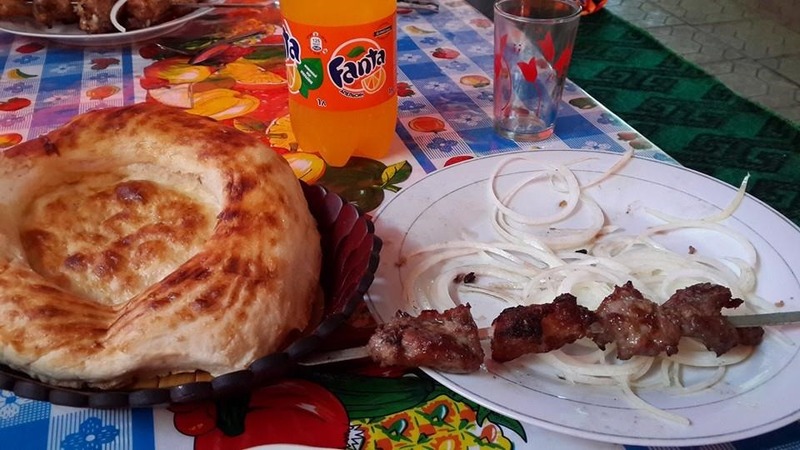 What’s better than traditional Kyrgyz Home cooking? They made this traveler feel like I was a dignitary. Very special treatment. They were so nice and kind, and so willing to do whatever was needed. I wasn’t hungry for days afterward. 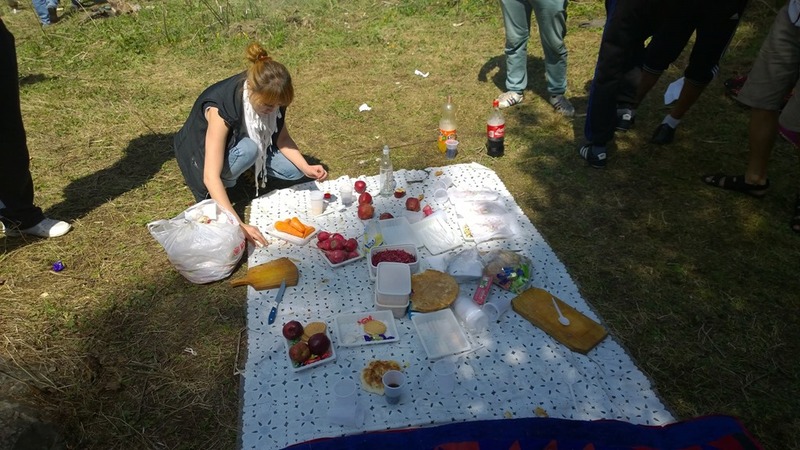 I still get a big smile when I think about how incredible it was to make a local connection and meet a real family to experience the traditions and values. Even though I was only in Kyrgyzstan for a few days, this connection will last a lifetime. I hope I can return the hospitality some day Azat! Azat and family were so cute. I had an amazing time getting to know them and sharing some of my life experiences with them. We shared stories and really connected. 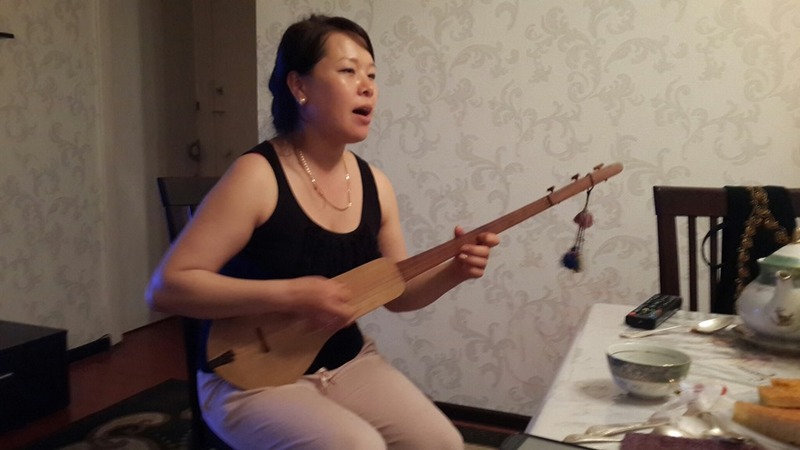 His wife played on her traditional instrument the komuz the national instrument. 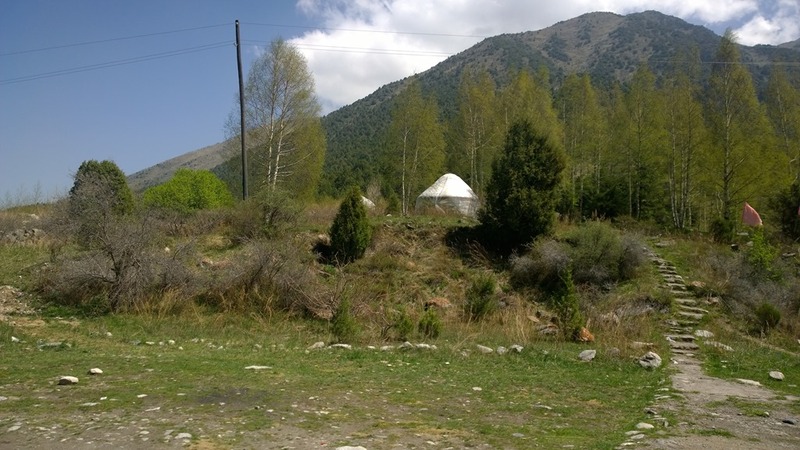 At the top of the Yurt is the iconic symbol of Kyrgyzstan. 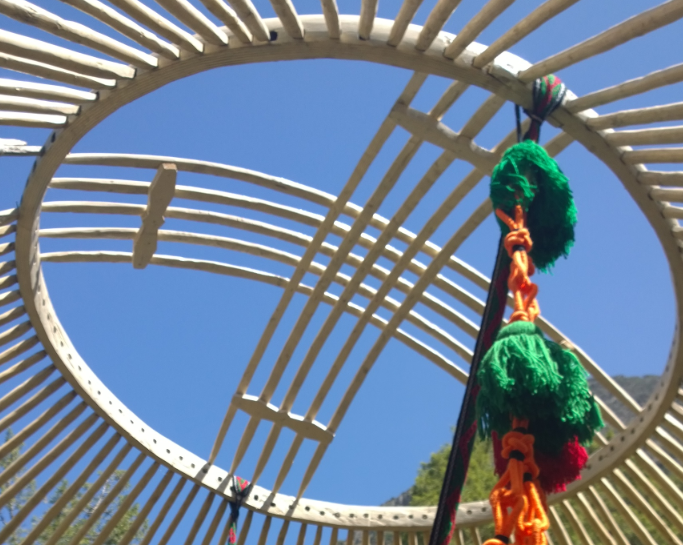 At Ala Acha there was a family that was setting up their yurt and was happy to let us see it come together. There is much pride and honor in these portable homes. The history and family traditions run very deep. The locals are very humble and extremely nice. As we were hiking, I saw this group of Kyrgyz teens. They were making soup. Cutting up carrots and potatoes. Really. Traditional meal after our hike. Carbonated yoghurt sheep milk and soup. All of this talk of nature and simplicity should also include some caveats. While the cities have plumbing, the more remote villages have out houses. 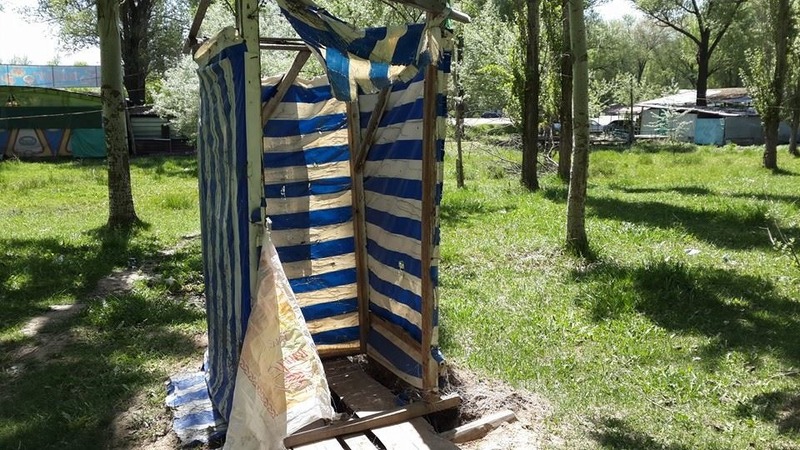 This make shift outhouse has a hole and boards in a very traditional rest room out back behind the restaurant. In life and in death there are many of the same symbols. 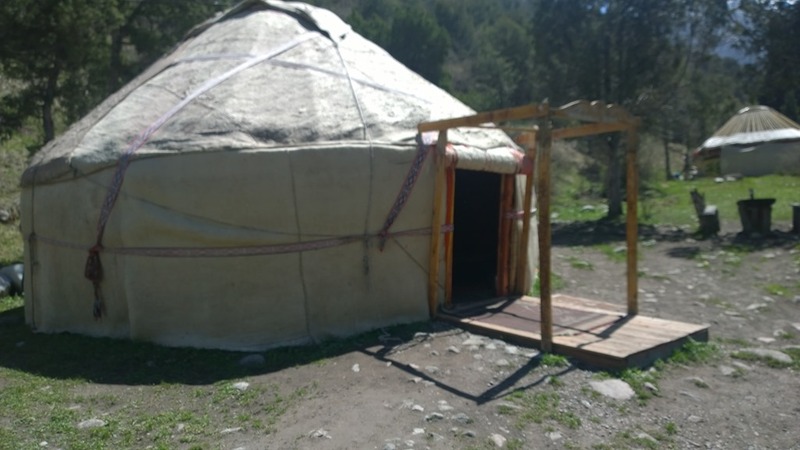 Religious symbols and the national symbols that are incorporated from the Yurts are very common. Lots of symbols in the impressively ornate graves that celebrate the next chapter of our journey. 80 KM from Bishkek on great roads. 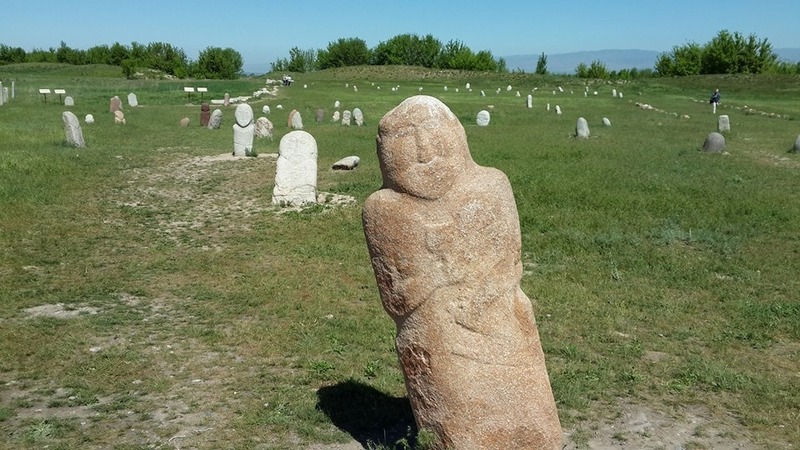 The tower, along with fascinating stone grave markers, some earthworks, is all that remains of the ancient city of Balasagun, but now there’s a yurt with souvenirs, and a little museum of odd things from the area. (Not much in English. Mostly Russian.) 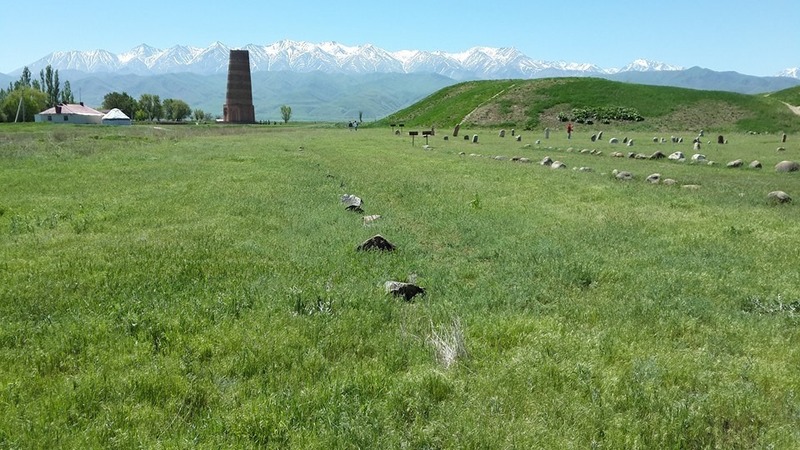 This area was at one point a large city established by the Karakhanids at the end of the 9th century. The Tower is fantastic. It’s been restored, but it really is very unique and if you’re claustrophobic you’ll find a real challenge. It’s quite dark and daunting, but as you can see in my pictures, if these kids could make it up, I could. There is an external staircase and then a steep, winding stairway inside the tower allowing you to climb to the top. The grave markers and stone carvings contain a fascinating mix of Buddhist, Islamic, and early man. It’s a fascinating area that gives you the impression that this place has been inhabited since the dawn of man and is a very important place. All that’s left of the city is earthen mounds and rooms. It’s still amazing to feel like an archeologist to walk around and put together stories of the castle and mausoleums that once were here. These mounts were once a great city in the 9th century. The ancient city of Balasagun also known as Gobalik (pretty city) by the Mongols who captured the city in 1218. 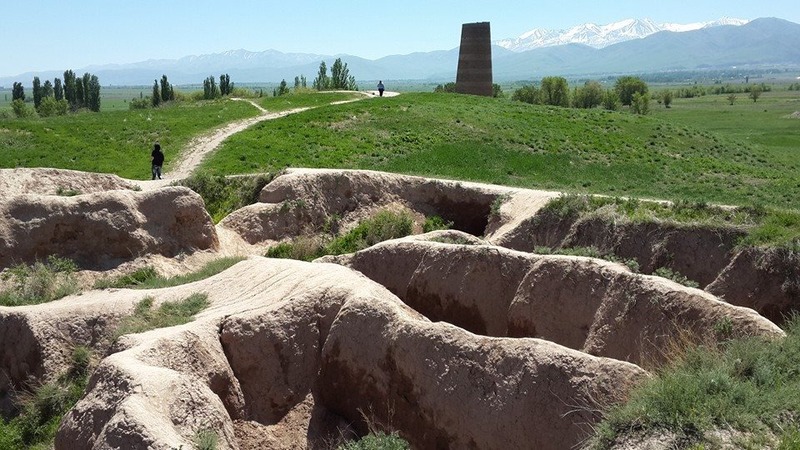 Balasagun was founded by Soghdians, a people of Iranian origin and the Soghdian language was still in use in this town till the 11th century. It was the capital of the Kara-Khanid Khanate from the 10th Century until it was taken by the Kara-Khitan Khanate in the twelfth century. 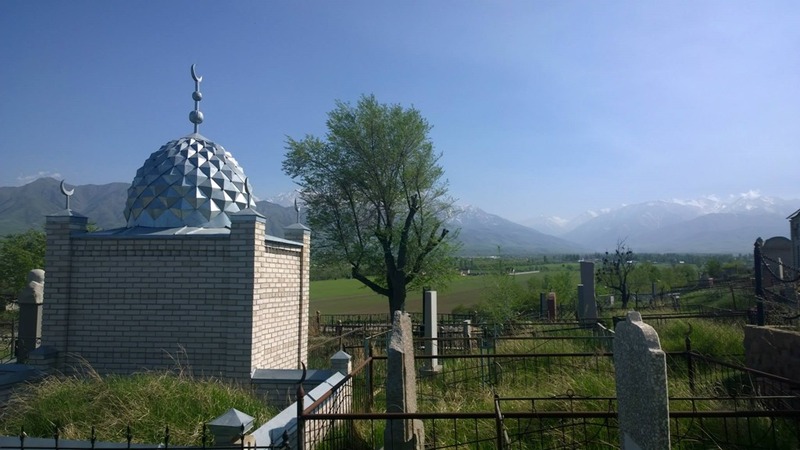 The Khitans used this as their capital, but were a mix of buddhist nomads, and muslim people as well as traditional khitan. 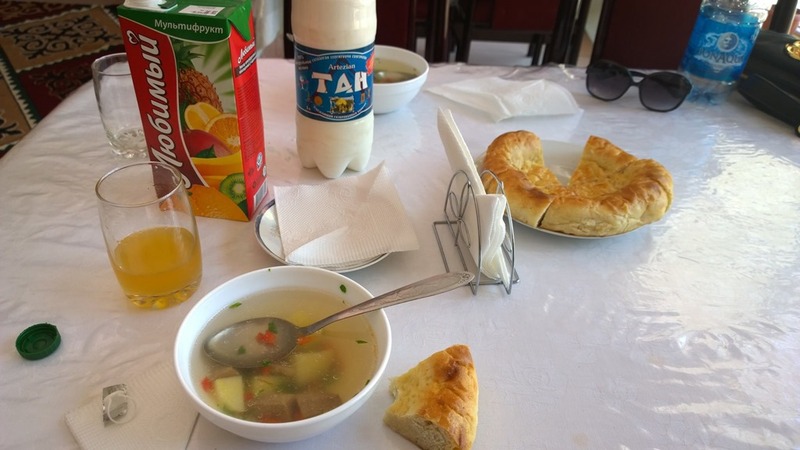 The food in Kyrgystan is not to miss. The freshest meats you’ll ever find. Sheep, Chicken, Beef skewers called Shishka. The dinning is nice. Traditionally we’ll sit on the floor with cushions around a short table. It’s very family and socially oriented. It’s not about eating fast, it’s about enjoying the company you are with. The drapery helps you get some level of privacy if you want it. There are similarities in the food across central asia, but each country does their traditional rice dishes very different. Each tribe of people has their own way, so you’ll often find different cities have their own flavor. In Bishkek it’s traditional to have a little bit of horse meat with the Osh (regional rice dish). 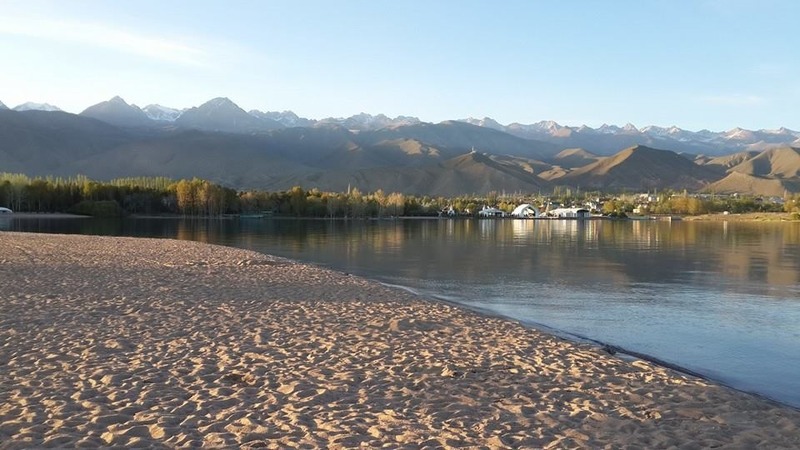 One of the largest lakes in Central Asia and really what the locals consider going to the beach. There are even changing rooms and sand. 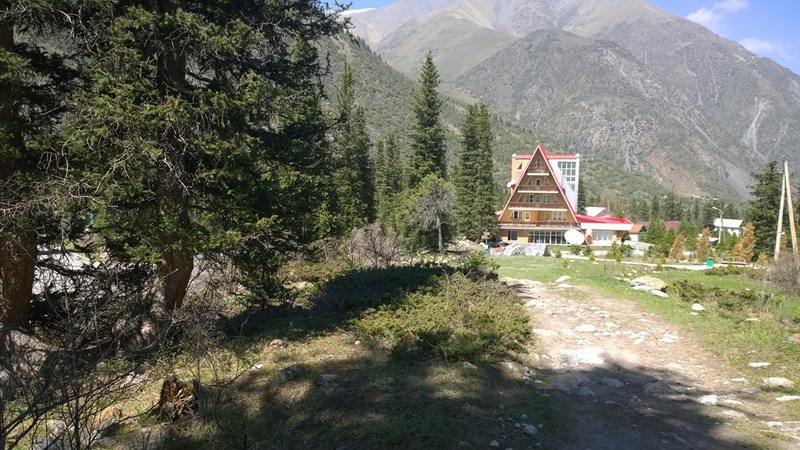 Highly recommended to see what a Kyrgyz retreat is like. With the help of our driver we found a variety of small cheap hotels for around $20 even with wifi. I did end up jumping in the lake and swimming around with some Russians on vacation. 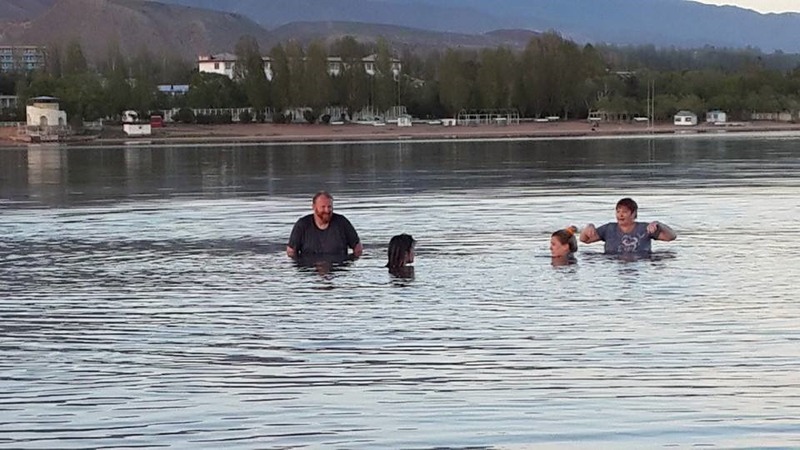 They didn’t speak any english and my handful of words in Russian didn’t keep us from having a good time splashing around in the fresh, but freezing water as the sun set. The lake is a very important region supporting life of all types and is recognized as a UNESCO Biosphere Reserve of Izzyk kul. The snow leapord is in the mountains surrounding this lake. 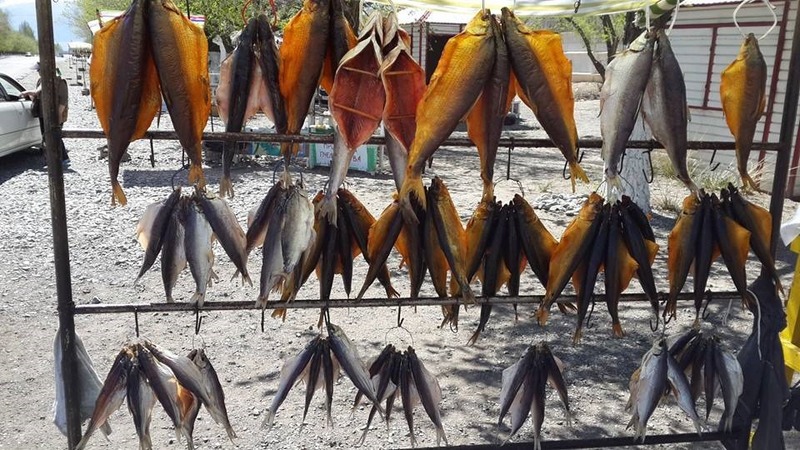 Ladies sell dried fish and honey on the road near the banks of the lake. Also near the lake is a prehistoric tribal outdoor museum that contains many mounds, mausoleums, rock carvings, and petroglyphs. Glacial Mountains in the background of the sandy beaches of lake Izzyk kul. 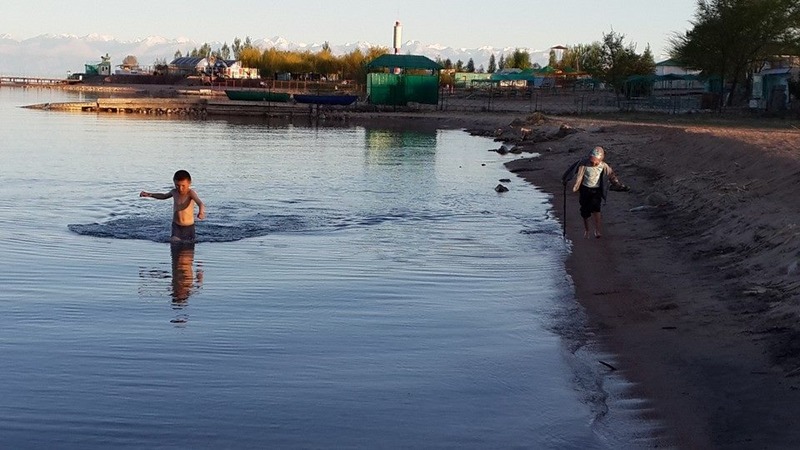 Kyrgyz Kids playing on the beaches on the coastline of the worlds 2nd largest high lake of Izzyk-Kul. 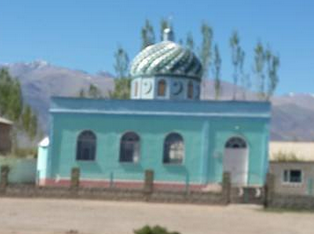 I dove into Kyrgyzstan and made some great friends and a new favorite place in this world. I highly encourage it you to visit Bishkek and surrounding. Don’t stay in the city, go into the mountains, and valleys, visit the lake. You must roam! 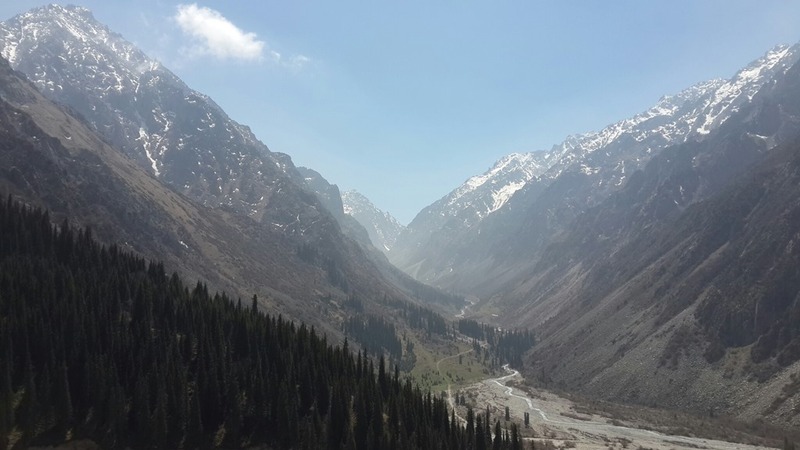 Don’t let Kyrgystan be one of those places you’ve never been. It’s an incredible experience.